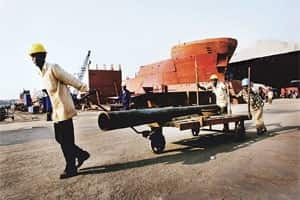 Mumbai: Companies that have expressed their interest in building two large shipyards planned by the government are now asking for several incentives, including a special economic zone status for the facilities. The companies claim these will help them save on taxes and make them more competitive. In a wish list submitted to the government last week, these companies have asked for an extension of the 30% subsidy that ended on 14 August, a service tax waiver and exemption from various taxes such as octroi, sales tax and entry tax levied by the state governments. And apart from tax incentives and administrative exemptions, being located in an SEZ could also mean flexible labour laws. Lining up: A file photo of workmen at the ABG Shipyard in Surat. ABG is among the firms interested in setting up a shipyard that will eventually be able to build ships that can carry up to 300,000 tonnes. The subsidy means that a company that receives an order worth Rs100 crore will receive Rs30 crore from the government. The subsidy is motivated by the fact that shipbuilding is a capital- and labour-intensive business that, apart from creating jobs increases demand for materials such as steel. The government wants to create these shipbuilding facilities, one each on the east and west coasts in an effort to give a fillip to the shipbuilding industry in the country. Both shipyards will initially have the capacity to build and repair ships with a cargo carrying capacity of around 175,000 tonnes. This will later be expanded to 300,000 tonnes. Currently, there are no shipyards in India that have capacity of such magnitude. South Korea’s STX Shipbuilding Co., the UK-based McNulty Offshore Construction Ltd, Larsen & Toubro Ltd, ABG Shipyard Ltd, Shapoorji Pallonji & Co. Ltd, Essar Constructions, Apeejay Shipping Ltd, Goodearth Maritime Ltd and IMC Ltd have expressed their interest in setting up the shipyard on the east coast. And STX, L&T and Bharati Shipyard Ltd have expressed their interest in setting up the shipyard on the west coast. In their wish list, the firms have also asked for capital investment grant and the government’s assistance in securing an environment clearance for the project and acquiring land. An executive at Shapoorji Pallonji said the government should take the lead in getting environment clearances for the project and also help the developer acquire land for the project. “Projects are often delayed due to lack of environment clearance, while land acquisition often ends up in litigation," said the executive who did not wish to be named. “The government will play a facilitating role without making substantial investments in the projects. Private participation will be encouraged to set up the two yards," said an official in the shipping ministry who did not wish to be identified. The ministry is in the process of hiring consultants to help execute the projects, he added. The Union government-owned Ennore port and Mumbai port have been nominated the nodal agencies to process the tenders on behalf of the shipping ministry for implementing the projects; each of the yards will cost around Rs2,000 crore, and be set up as public private partnership projects. Apart from building ships, the yards will also be able to repair 75-80 ships a year. The Indian shipbuilding industry has grown in recent years—one reason for this could be growing demand for ships all over the world which has led to traditional ship-building nations such as Japan and Korea actually turning away orders for small ships; many of these come to India. Local builders such as L&T, ABG, Bharati, Cochin Shipyard Ltd, Hindustan Shipyard and Mazagon Dock Ltd are currently building around 240 ships worth Rs18,000 crore. However, in absolute terms, India’s share of the global shipbuilding ndustry by value is around 0.5%. The government’s move to set up the two large shipyards is part of an effort that seeks to increase this share. India’s share in global shipbuilding could go up to 15%, or $ 22 billion, by 2020 on the back of cost competitiveness and abundant supply of skilled manpower, according to a report prepared by Mumbai-based consultancy firm, i-maritime Consultancy Pvt Ltd.